Creative Nightscapes has been providing Murphy residents and business owners with dependable, high-quality outdoor lighting design and installation services for more than a decade. Company owner Patrick Cheatham founded Creative Nightscapes in 2004, and we now have a team of over a dozen employees available to help Murphy customers enhance their property. In fact, we have done more than 4,300 outdoor lighting projects overall throughout the years. 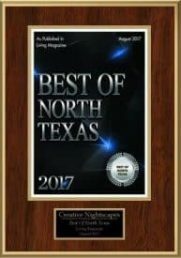 As a member of the Association of Outdoor Lighting Professionals and the Better Business Bureau, Creative Nightscapes takes pride in providing superior service to all of our customers. Previous customers who have worked with us have left glowing reviews of our services. These customers have shown great appreciation for the professionalism and quality of our work. Our customers have also mentioned how quickly projects were done and how satisfied they were with the results. Our landscape lighting services in Murphy allow customers to improve the appearance of their property. These lights can draw the eye to particular features on homes or specific features in gardens or other landscaped areas. Creative Nightscapes has a team of professionals available to help with designing and installing these lighting systems. LED lighting systems for outdoors provide our customers with ways to light up gardens, exteriors, and other areas without using as much energy. Creative Nightscapes offers quality LED lighting systems in the Murphy area for residential and commercial customers. We can help you with creating the right LED lighting design for your property and install it for you. Having a high-quality security lighting system on your residential or commercial property offers enhanced safety. These lights can keep intruders away and also reduce the risk of falling on dark pathways and other outdoor areas. Creative Nightscapes can help you design and install the ideal security lighting system for your home or business in Murphy. Patio lights can provide the right ambiance to encourage you and your family to sit outside more often on warm summer nights. Creative Nightscapes has professionals available to help you with patio lighting design and installation for your home. We can help you choose from an impressive range of outdoor patio lighting options. Having the area around your pool lit up at night makes it much safer for you and your family to swim. This lighting can also be expertly designed to provide a certain atmosphere. 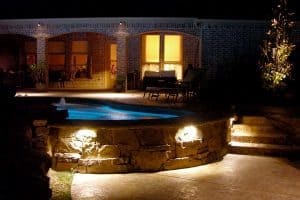 At Creative Nightscapes, we offer high-quality poolside lighting for residential and commercial customers. 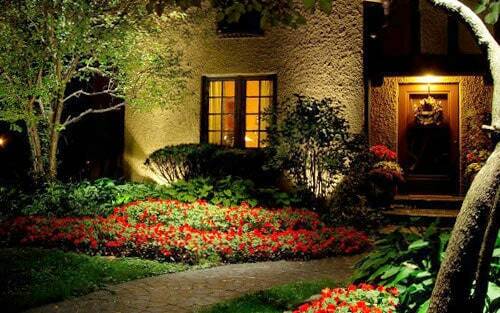 Your garden can come to life at night with the right outdoor garden lighting system. Creative Nightscapes can help you design an outdoor lighting system for your garden. Our team will then install it for you to enhance your property. Our garden lighting services are available for residential and commercial customers in Murphy. If you would like to know more about our outdoor lighting services for residential and commercial customers, contact Creative Nightscapes. Keep in mind that we also provide these services in nearby cities, including Plano and Sachse. Installed Kichler LED outdoor lighting at home in Aviary Sub Division. Placed up lights to accent facade of home, columns, grand entry, and Italian Cypress trees. Set path lights to illuminate front walkway and steps.